WELCOME, N.C. (November 6, 2018) – The United States Air Force will once again be the primary partner of the No. 43 Richard Petty Motorsports Chevrolet Camaro ZL1 team this upcoming Veteran’s Day weekend. The popular Air Force scheme will be driven by Bubba Wallace during Sunday’s Can-Am 500 at the ISM Raceway located just outside Phoenix, Arizona. 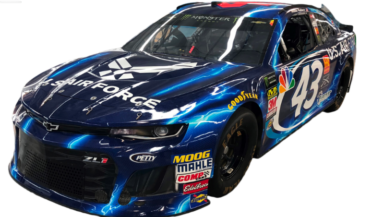 The Air Force has partnered with Richard Petty Motorsports for 10 consecutive seasons and has a tradition of featuring their scheme on the track during the most patriotic times of the year. Wallace Jr. raced the Air Force colors during the July 4 race weekend at the Daytona International Speedway and finished 14th. Air Force Recruiting Service, charged with the mission to inspire, engage and recruit future Airmen, is proud to partner with Richard Petty Motorsports and Wallace Jr. to build awareness about opportunities in the Air Force. Recently, Wallace Jr. was invited to 9th Air Force, Shaw Air Force Base in South Carolina to fly in an F-16 with the 77th Fighter Squadron known as the “Gamblers.” Wallace Jr. went through flight training before taking to the sky with Maj. Gen. Scott Zobrist, 9th Air Force Commander, and rookie pilot, Captain Jack Howard. Wallace Jr. participated in flight drills and experienced over 9Gs of force while in the air. Wallace Jr. has already visited four different U.S. Air Force bases in his first year with the partnership. He has visited Airmen at Randolph in San Antonio, Texas, Seymour Johnson in Goldsboro, North Carolina, Wright-Patterson in Daytona, Ohio, and at Shaw, participating in different drills at each base. In addition, Wallace Jr. and “The King” Richard Petty meet young men and women of the Air Force each weekend. Wallace Jr. will go to ISM Raceway with multiple Top-10 finishes in the NASCAR Camping World and XFINITY Series. The Can-Am 500 will be televised nationally this Sunday, November 11 at 2:30 p.m. ET on NBC. The race will be broadcast on MRN and SIRUS/XM radio Channel 90. You can also stream the race online on the NBC Sports app. The mission of the United States Air Force is to fly, fight and win in air, space and cyberspace. For 2019, the Air Force Recruiting Service is hiring over 32,000 new Airmen with an emphasis on recruiting people with no prior military service into one of over 130 enlisted career opportunities. The Air Force recruits to retain, so we recruit the brightest candidates possible, then provide them with tough, highly technical training that gives them the right skills to sustain the combat capability of America’s Air Force. For more information about Air Force opportunities and benefits, go to www.airforce.com.